I had mentioned that I was going to try and squeeze in some work, prior to taking off for the 1st Annual NW Arkansas Hot Rod Hundred. I was able to get down to the shop on Thursday evening and get the new bushings and lowering blocks in the back leaves. I’m very pleased with the results. I’d imagine that the rear leaves will have some additional sag over time, since I de-arched them 2″. Friday, I took the ’40 stake truck and made the run down to Springdale, AR, and participated in the 1st Annual NW Arkansas Hot Rod Hundred. The event was a blast, but I’ll save that for another post. The point being, I took some of my “shop time” away for “playing with cars” time. 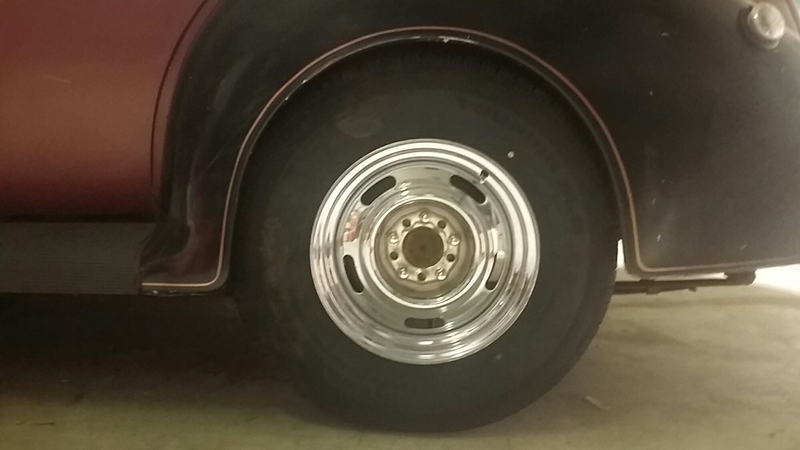 Got the new urethane leaf spring bushings installed out back and added the 3″ lowering blocks. Finally sitting within the range of where I wanted it to end up. A shot from the driver’s side. The dropping of the rear did cause the front end to come up some, which was all within the plan. 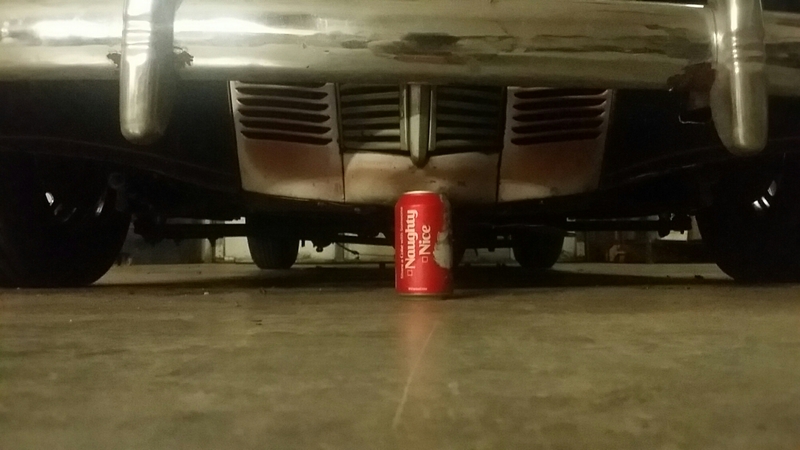 Still can’t fit a Coke can under the grille, so that is good. After getting back from Arkansas, and knowing that I had a stash of new front brake parts, it was eating me up to not go down and make some progress. 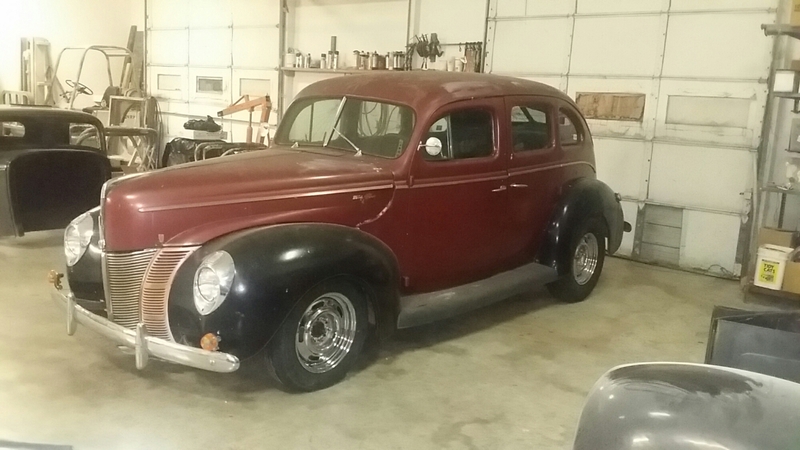 I loaded up into the ’40 stake truck and ran down to the shop to at least prepare the parts for assembly. Doug told me he wouldn’t make it up to the shop, but he showed up, and without trying to, spurred me on to install everything. Glad that happened, because now, I just need to go back through and make sure all the front end nuts are tight and install cotter keys. 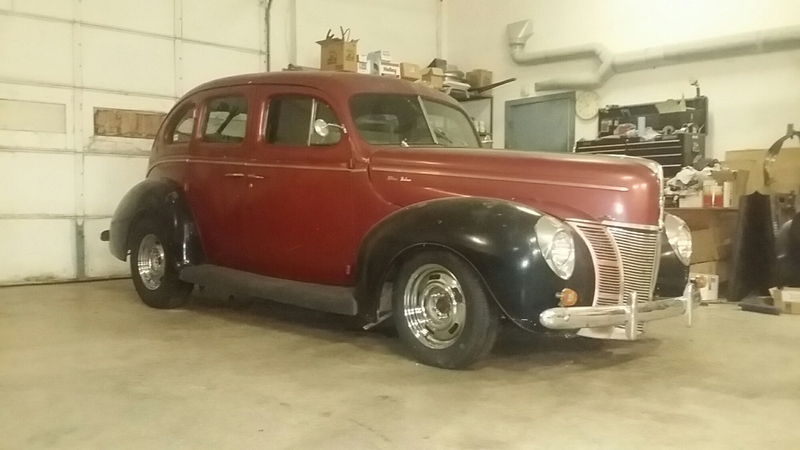 Now my brake work is down to swapping rear wheel cylinders, a new master cylinder and probably booster, and we should have brakes. Sunday afternoon, I went ahead and swapped out the front brakes to the new Speedway “Metric” caliper kit. 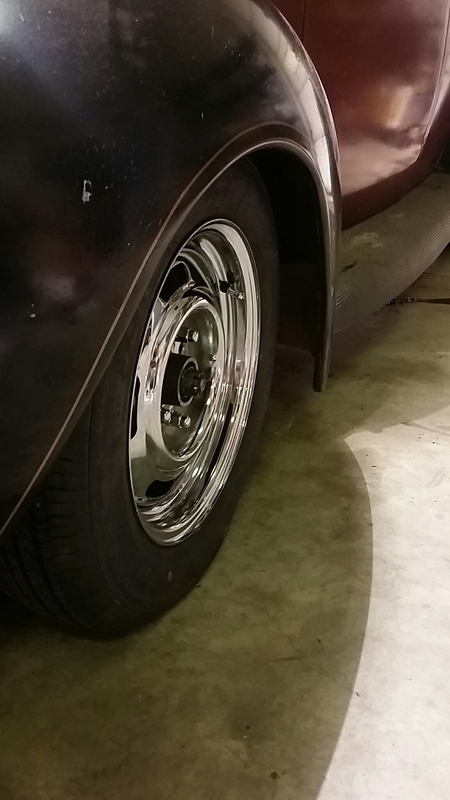 The cool thing is that the rotors leave the wheels sitting in about 1/2 to 5/8″ deeper into the fender well. Just like I like them! Still trying to identify the origin of this power booster. From what I have found, it appears that it is from a mid ’60’s Chevy truck. The engine is extremely filthy, and in need of some scrubbing. Carb is off for a rebuild. Talked to my buddy, Joe, and he’s gonna help me rebuild my carb on Friday. Hope to finish the brakes by this weekend and start on the wiring. As soon as I can get the ignition circuits wired up, I’ll be itching to fire it up and see if it will run. 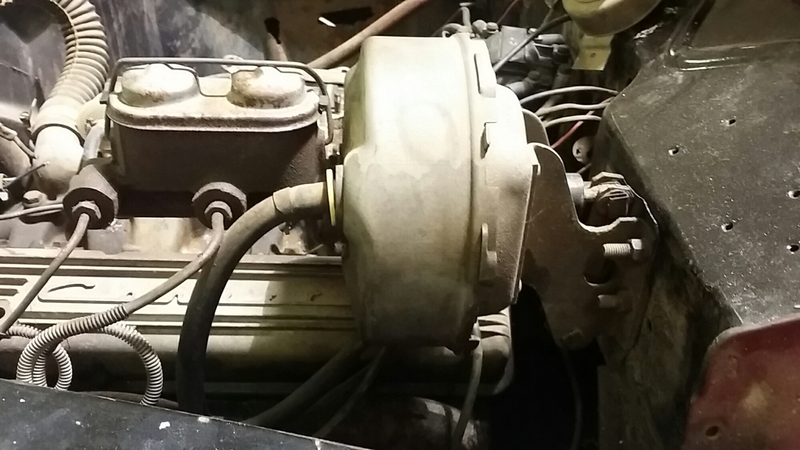 I did see, while crawling under the car, that the engine still has a canister oil filter, so that means that it is at least a 1967 or older. 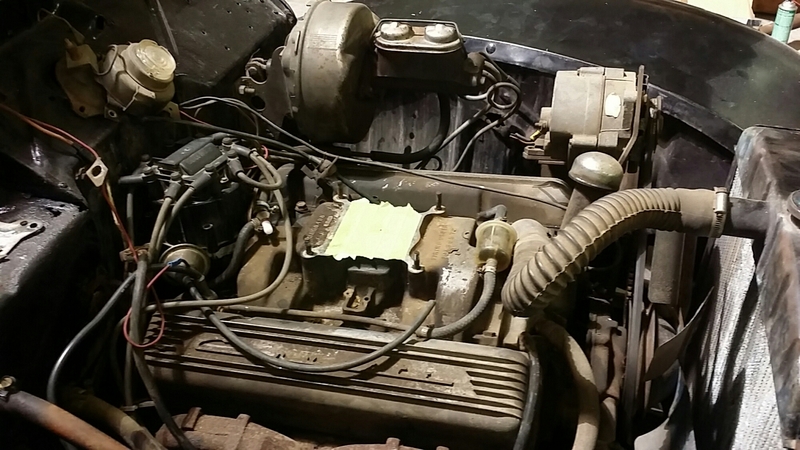 The intake is a ’66-67 350HP 327 Corvette intake, so that shows some consistency with what I was told about the engine. I did find, in my spare junk drawer, an old Mr Gasket spin on oil filter adapter, complete with rubber O rings, bolts, and thread locker, so that’ll be one of the first “modifications to the engine.